Last Monday at our weekly Knit & Crochet Night, we kicked off the start to our Queen Anne Mitts Knit-Along. It’s so fun to see these working up in everyone’s different, beautiful yarns! Concurrent with a simple K1P1 ribbing pattern, I’m already on to the last repeat of the leafy lace pattern before the gusset, which I’ll be starting this coming Monday at our next Knit Night. Did you know that even though these gloves look cabled, there is actually no traditional cabling involved? It’s just a creative combination of knits, purls, yarn-overs, and decreases. And the best part is, the pattern gives both charted and written instructions, so no matter which format you prefer, there’s an easy option for you. It’s not too late to join our Knit-Along if you want to hop on board with these mitts, too! 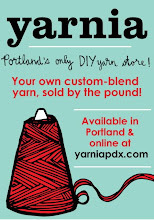 Just sign up here to receive 15% off your yarn for this project, and come join us this Monday night, from 5:30 to 8:30 p.m.! « Little Boxes is Just Around the Corner!